Some 100 to 150 years ago, chemists performed most solution analyses observationally. The colour of the solution and its intensity indicated the proportion of the substance in the solution. It took another 20 years to invent the first optical spectrometer. The chromatograph/mass spectrometer is a recent invention. Production and marketing of scientific equipment has now become a profitable industry. Today, a simpler spectrometer used only for laboratory measurements costs 10,000 to 15,000 euros, and it is updated almost every year. Equipment manufacturers entice researchers with new and more attractive models. But are constant upgrades justified? After all, the technology used for standard chemical measurements has often remained unchanged for decades, and the emergence of new instruments on the market does not necessarily mean a significant quality leap in measurement. Researcher Mihkel Koel of the School of Science, Department of Chemistry and Biotechnology says, "Being green chemists, we are battling to reduce the ecological footprint of chemical measurements. Measurement results of the same quality can often be obtained faster by e.g. a 500 euro cell phone. In the outdoor environment and in the circumstances requiring a rapid result, we can obtain a completely reliable result by using a free mobile application rather than expensive instruments." It is the fundamental principle of green chemistry to obtain measurement results quickly and as easily as possible by practising green and sustainable methods. Professor Emeritus of the School of Science Mihkel Kaljurand says that it is obvious that the industrial enterprises have no particular interest in providing less costly alternatives. "Why should they do that? It is easier and more profitable to go along with the increasing consumer frenzy and encourage consumerism when acquiring scientific equipment," Kaljurand says. It is usually claimed that a time-consuming analysis performed with expensive instrumentation is more convincing. According to the scientists, most basic chemical analyses could be carried out with simpler tools, especially in medical institutions and research centres, where the costs often exceed the actual needs. 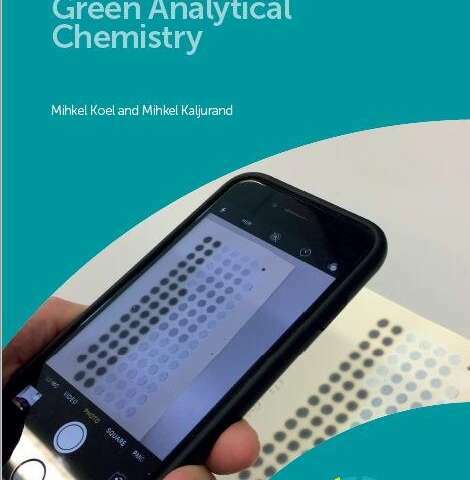 The ultimate goal of green analytical chemistry, however, is to develop chemical measurements to such a level that anyone can perform analysis that is of interest by using an inexpensive sensor integrated into a user's cell phone, for instance. Examples of technology allowing consumers to check the quality of food in a store can already be found in professional literature. Professor Miguel de la Guardia from the University of Valencia refers to this development as democratization of analytical chemistry. The chemists Koel and Kaljurand have been engaged in the research of green scientific equipment and chemical analysis since 2006. The topic was discussed in detail in the book "Green Analytical Chemistry," written by the scientists and published in 2010 by the Royal Society of Chemistry. The book was so popular that the publisher ordered a revised edition from the scientists, which reached readers in April 2019. In the revised edition, miniaturization and use of modern smart materials in today's chemical analysis are discussed.